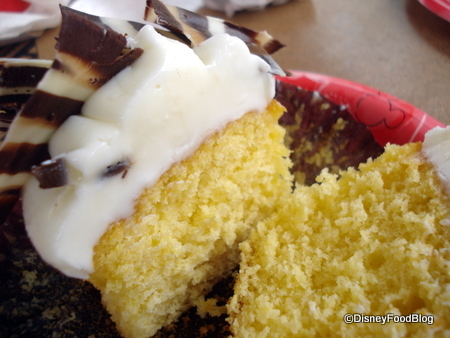 Over at The Disney Food Blog, AJ posted about these amazing-looking zebra cupcakes! 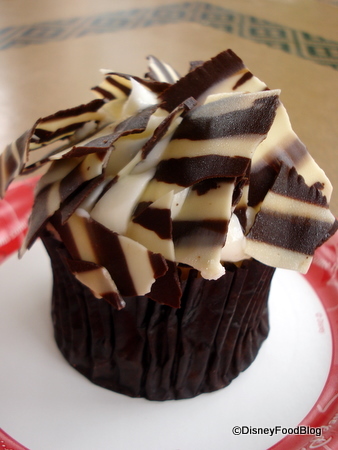 It’s clearly the Disney dining equivalent of avant garde artwork — a representation of a zebra vs. an actual molded animal, as you find in the White Chocolate Elephant Cupcake, also sold at Kusafiri Bakery. Personally, I think it’s beautiful, and it actually reminds me of the puppeteer-ed floats that prowl the streets of the Animal Kingdom during the parade each afternoon; the angular puppets, stark color contrasts, and artistic animal representations in the parade make me feel that this cupcake is right at home with the way the Imagineers are presenting the animal details in the park. They’ll often give you the impression of the animal, and your imagination takes it the rest of the way. But, we’re not here to talk detail and design. Let’s talk cupcake. As I said, the thing is giant; easily the size of the chocolate peanut-butter cupcake and easily enough to split between two (or three!) people. The vanilla cake is incredibly moist and super-sweet (I’m always amazed how they keep the mass-produced cake tasting so fresh and moist). And the mounds of vanilla buttercream frosting, again, have a great texture. This frosting is creamier than your typical birthday cake frosting, though — it’s not the same stuff you find on the Butterfinger Cupcake. While just as thick, it’s smoother. Wow! Another cool post this week! Love your cupcakes! hi, can I ask? how did you put this comment button? where did you get this?